A crow, the Knave of Rooks, as seen in Crow's Wood. Crows are black birds. 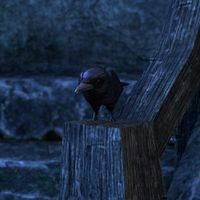 Most are aesthetic rather than being true creatures, but there are a few crows existing as actual creatures in the game. "The Knave of Rooks as he appears in the Clockwork City dlc." Lady Blightwing, Jongleur of Filches, Squire Peck; members of the Blackfeather Court found in the Brass Fortress. 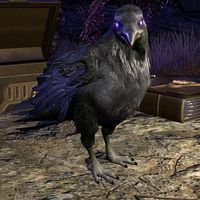 After slaying Uela the Hagraven, the crows trapped spirits will merge with their bodies and descend to start feasting on her corpse, one of them will call out to you. Crow: "You killed her. You freed us. Haha!" "Freedom. Freedom at last! And Uela dead. Dead!" "Sweet relief. No more voices, no more restraint. Bodies and minds together again. The crows of Jackdaw Cove are in your debt." I'm just glad you're free again. "Yes, free and feasted! The Hagraven was all skin and bones, but what's there is sweet to eat. So thank you for saving us, and thank you for supper!" I'll leave you to enjoy that then. As the group led by the Ritemaster trudges forward through Evergloam searching for answers, some crows continually mock the Ritemaster. Blackfeather Crow: "He doesn't remember! So desperate he was, he leaped at our Mistress' offer!" Ritemaster Iachesis: "Speak plainly, crows! Come back here!" This page was last modified on 7 January 2019, at 01:47.